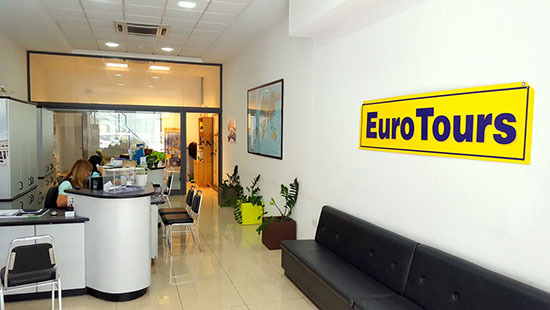 Based in Hamrun, Euro Tours opened its doors for business in May 1981. Since its inception, the main aim of the company has always been to provide professional travel service to the travelling public, be it for individuals, corporate or leisure, and also for group travel. Euro Tours are pleased to say that over the years, they have established themselves as one of the leading outgoing main tour and individual travel operators in Malta. Since Euro Tours believe that clients are guests than merely numbers, they emphasise that every element of a holiday is properly taken care of, no matter how small. Euro Tours ensures that their dedicated staff gives the optimal service, advice and guidance to our clients. This is reflected in the ever increasing number of clients using their services every year. Euro Tours pride themselves in offering an exciting portfolio of good quality tours at affordable prices to the Maltese public. Be it a day return to nearby Sicily, one of the vast choice of European destinations, a long haul holiday to other continents or a cruise, Euro Tours are sure that one of our tours will fulfill your wish. But, it doesn’t stop there …… If you like to enjoy the flexibility of building your own package holiday, Euro Tours really have all your travel needs covered. So what are you waiting for? Come and book your next holiday and make your travel dream come true.